You remember that charcuterie guy we told you about forever ago. The one who cut his teeth at Fatted Calf and the French Laundry. Likes antique butcher knives. Speaks fluent Pig. It’s Kevin Ouzts from the farmers’ market circuit. The Spotted Trotter guy. Well, he’s going brick-and-mortar now. 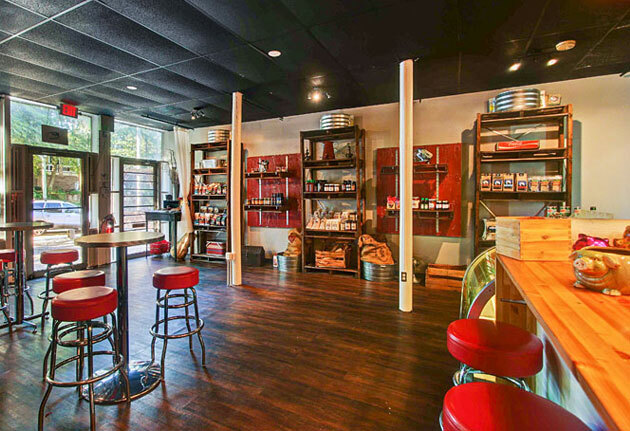 Say hello to the four-walled version of The Spotted Trotter, a pocket-sized charcuterie house and your new munitions depot for all things hog, opening Friday in Kirkwood. So yeah, right around a year and a half ago, Chef Kevin started the city’s first mobile charcuterie, hitting up farmers’ markets and keeping restaurants like Haven and Rosebud in pig. But now you’ll know exactly where to find him. It’s small in there—sausages hanging from hooks in the window, a meat slicer, a few books like The Whole Beast and the Meat Bible lying around. Oh, and a giant deli case soon to be brimming with Southern stained jerky, fresh sausages and salamis, bacon, terrines and primal cuts like pork chops and rib eyes (they’ll also be doling out hot chicharrones to go). And once they break in the new digs, expect hog-centric cooking classes and butcher demos out on the patio. Patio butchering: kind of hot right now.